“Outbound communication around elections has become critical,” says Christopher Thomas, Director, Esri Government Markets. Esri is a HERE partner, layering HERE data on its GIS platform so both the public and private sectors can create apps to enable all the various election processes including volunteer recruiting; voter registration; polling place locators and site selections and navigation; voting district and early voting management; redistricting; and election history tracking and election night reporting. HERE is a company co-owned by German automotive companies Audi, BMW, and Daimler that has its roots in Navteq that was acquired by Nokia. HERE provides mapping data, technologies and services to the automotive, consumer and enterprise sectors and is based on a cloud-computing model. * Search and display by a set of criteria e.g. show on a map all 2014 Primary Voters by district. * Search, filter and display e.g. show on a map all 2014 primary voters who voted in the last 3 elections or show only hard democrats. * Spatial query e.g. 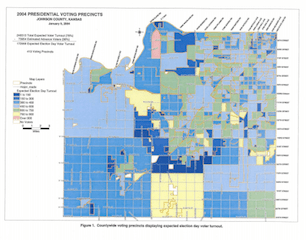 selecting a group of voters, by drawing a square on the map, will provide a voter summary. Maybe the number of voters selected, average distance between voters, total number of hard Republicans in this group, or number of perfect voters. * Identifying best locations for candidate events. Field staff use mobile GIS apps, and using these apps, field directors will be able to see the progress of sign placement operations, volunteer recruitment, and literature distribution. They will also be able to track the location of field workers while they are interacting with voters and view responses in real time. The data recorded in GIS systems can be used for mass e-mails, the content being related to the voters’ district or location. According to Connie Schmidt, election commissioner for Johnson County, Kansas, their election office develops what they call a “voting area map.” The map is developed several months prior to the election by gathering voter registration data by precinct to formulate and project expected voter turnout as well as election resources. This information becomes integrated into the GIS by merging numerical data with a spatial representation of voting precincts.Each polling place location undergoes strict evaluation, rating and coding for suitability. It must have compliance with Americans with Disabilities Act and provide general voter convenience by its location. Collin County, Texas has had tremendous results with its election polling places finder application — including 174K pageviews, 20K visits to the app and 27K routes generated from the mobile app. Exit polls on election day are important as they can relate to election result prediction. GIS can be used to record problems at polling stations such as voter intimidation, which may be important in the upcoming election. Recording interview location, voter response, images of ID cards and polling station problems such as lack of handicapped parking can be important information that mobile GIS can help gather, to prevent the disfranchisement and intimidation of voters. Election monitoring can also be incorporated into election apps and maps. For example, using the Esri platform, Fairfax County, Virginia shared results every 10 minutes and averaged 800 visitors per hour. Candidates are using GIS for canvassing, and looking for swing voters by neighborhood. They can use alerts to remind people to vote and provide them with information, making it a lot easier in some cases, to reach the public than via door-to-door. 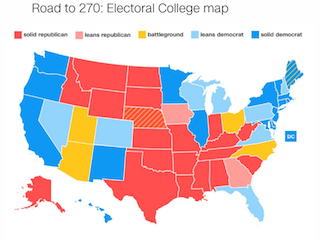 Much better results can be had by all political parties by being able to visualize their campaign on a map. They will have all the data in the one source GIS so they can conduct post-election analyses. Schmidt puts it so well: “it takes a community to conduct a successful election.” Using GIS has allowed the Johnson County Election Office to exercise control over what they describe as a “moving target” i.e. conducting an election. This entry was posted on Wednesday, October 19th, 2016 at 9:05 am. You can follow any responses to this entry through the RSS 2.0 feed. You can leave a response, or trackback from your own site.